Become a member of the Capital Club whenever you win the massive cash jackpot! Click here to play! There is plenty on offer here for everyone to enjoy, so start playing at this classic slot today. 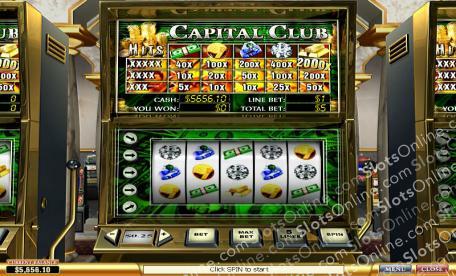 Capital Club is an exciting 5-reel slot played across 5 unique pay lines, where the more lines opened gives you more chances to make winning combinations. There are plenty of different symbols that can help you on your way to success; Diamonds will pay out incredibly well when you spin up 5 of them on an active pay line, but the best combination is 5 Gold Bullions in one spin! If you manage to succeed you will be rewarded with 2000 times your initial wager. There are no other Wilds or Scatters to distract you from winning, so all you have to do is start playing today to win!